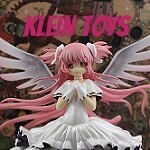 ← Pullip Monochrome Alice Limited Edition Update Again! JPGroove posted an announcement on their facebook page yesterday, regarding their website which has been relaunched with a whole new sleek design. If you get a chance to check out their new website it is very clean and easy to navigate, I often kind of lament that some doll websites seem to be still have the same clunky layout as they did like 10 years ago so it’s nice to see a store actually put significant work into their site and upgrade it, I just hope that the server has also been upgraded as JPGroove often seems to struggle with server strain during their special sales. Even more exciting than the website relaunch itself is that JPGroove will be having a special 12 hour sale to celebrate the website’s relaunch. The sale runs from 1/13/2018 12 pm PDT to 23:59 PM PDT which means it starts in roughly an hour not sure what time the sale runs in relation to your timezone? Check the world clock here. Use code RGSO2018 while checking out for 20% off of all products, this code does not seem to exclude any items from the website but the code is not active yet so I can’t verify this yet. They now have Gouk collaboration Pullips Shion and Kangezakura in stock who are kind of pricey so 20% off of them makes them extremely tempting especially the lovely Shion! It seems there will also be other sales or specials as well, these specials are currently marked as coming soon I am unsure if they will start today or another a date in time in the future as more details become available. Only the 12 hour sale is today not sure when the other specials will be just that they are “coming soon”. Special #2 Beginner’s Set featuring fan favorite Pullips Classical Alice, Tiphona and Alice du Jardin maybe some sort of special bundle deal featuring them? All three of these dolls seem to be very popular choices for first Pullip these days. Special #3 Buy two Pullip, Dal, Byul or Isul (unsure why Taeyang was excluded if that was an oversight or intentional) get one free random Little Doll (you cannot pick, truly random). 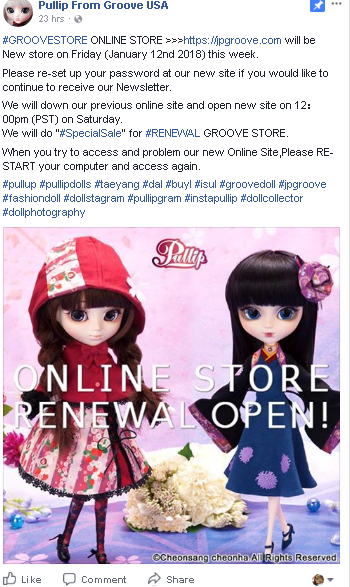 This entry was posted in byul, Dal, Doll, isul, Pullip and tagged byul, Dal, groove, isul, jpgroove, Pullip, pullip sale, taeyang. Bookmark the permalink.